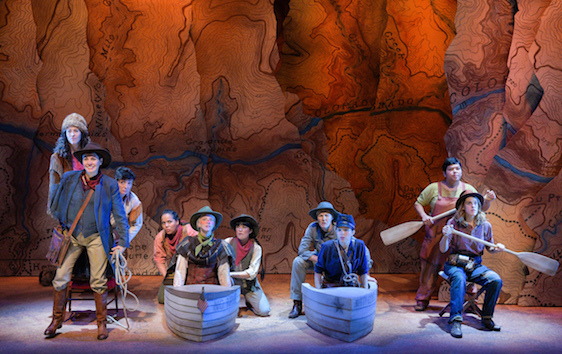 “Men on Boats” tells the story of the 1869 expedition by one-armed ex-soldier John Wesley Powell. 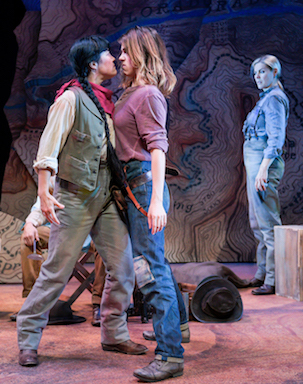 The playwright, Jaclyn Backhaus, was inspired by Powell’s published journals. 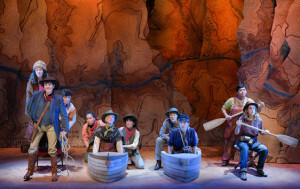 The historic expedition to explore the lower reaches of the Colorado River, via the gorges of the Grand Canyon was the first sanctioned by the U.S. government, one of many tongue in cheek facts pointed out throughout the play. These aren’t unexplored waters, but those previous expeditions, weren’t government sanctioned ones! Powell, a Civil War veteran, assembles ten men for the journey with varying skills and temperament. Represented by a cast of ten local racially diverse female identifying, trans-identifying, gender-fluid and/or non-gender conforming actors. 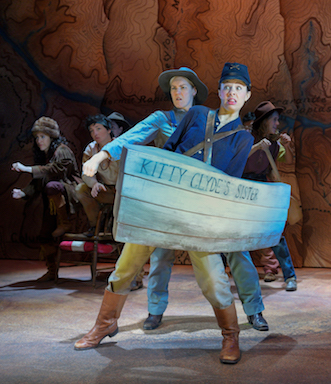 Some may ponder on why a play called, “Men On Boat’s” included no male identifying actors while others, are laughing at the ridiculousness of the hyper masculinity of it all and thinking, that could only have been portrayed this way. There is chest bumping, exaggerated cheers over found whiskey, and a blind following of their leader. There are also moments of bluntness about the countries past in which Native Americans and their knowledge of their land is dismissed unless the “brave” explorers needed help and/or food. One of the quirkier moments brought to stage involves the men naming areas after themselves. How about we name that after you moments followed by writing it down to make it official. In the end, Powell and his crew of 5, 4 drop out early on, find the camp they were directed to. They are welcomed by one of the dwellers with a hysterical speech about Powell’s future place in history. As for the other crew members, they went down in history nameless, and probably died in undesirable circumstances. We’ll never know what happened to them but, who cared, not the historians. Regardless, they stuck it out and helped their one armed leader survive and have his place in history, because that’s what men do, tough it out. Ahhh,, bromance. All the actors brought their A game in roles that required a macho bravado they would almost never get to play in other shows. They had good comedic timing, movements and great chemistry with one another. That and the minimalist set makes for an enjoyable theater experience full of laughs. Wednesdays and Saturdays at 2 p.m.